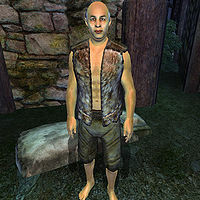 Bruccius the Orphan is an Imperial beggar living in Cheydinhal. You can find his bedroll and food bag behind The March Rider, near the well of the local Mages Guild. He lives like any other beggar, starting his day early at 6am and going to the east gate of the town to beg for help for four hours. At 10am he will move to a better place in front of The Great Chapel of Arkay to continue begging until 2pm. At that time he will change his location again; this time he will wander in front of The March Rider, asking for help from any of the townsfolk passing by. At 6pm he will head to his bedroll to grab some food and will head to Riverview to sit on one of the benches to have dinner for two hours. After he has had his only meal of the day he will head back to his bedroll to stroll around until his bedtime at 10pm. On rainy days, however, he will take cover under the roof of Riverview until it stops raining. His attire consists of two pieces of lower-class clothing, including a huntsman vest combined with belted braies. As a beggar his combat resources are very limited, and he relies solely on his fists during combat. You can contract the disease Rockjoint should you fight with him. He is one of the few people that can provide you the necessary information on how you may be able to join the Thieves Guild, and will also aid you during one of your jobs for the Guild. This page was last modified on 25 March 2018, at 02:44.